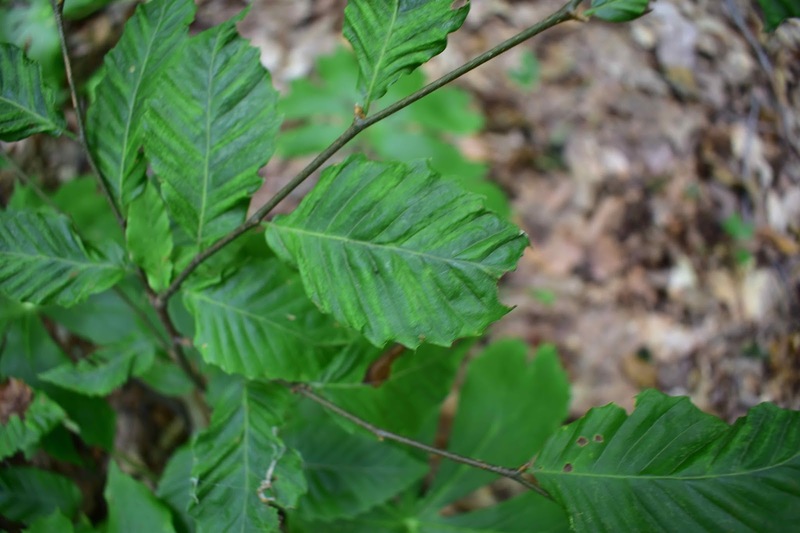 Beech Leaf Disease (BLD) is a recently detected disease of Beech (Fagus grandifolia) in northeast Ohio. First reported in Lake County, Ohio in 2012 (Ohio Division of Forestry, 2016), BLD causes Beech leaves to exhibit darkened bands between leaf veins (Figure 1). Figure 1. Photo of BLD infected Beech leaves in the North Woodlot of Squire Valleevue Farm, Hunting Valley, Ohio. Photo courtesy of Anthony Koonce. 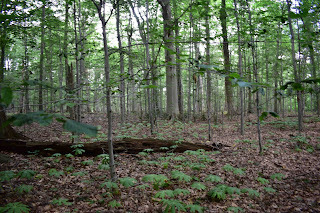 BLD is especially pronounced in the North Woodlot of Squire Valleevue Farm, and saplings Beech in the secondary canopy are showing substantial loss of leaf cover. In the Beech dominated eastern end of the North Woodlot, loss of leaf cover in the secondary canopy results in anomalously open areas in the forest (Figure 2). Oak and maple dominated areas, however, do not show this type of clearing of the secondary canopy (Figure 3). Figure 2. View of the secondary canopy clearing in the North Woodlot of Squire Valleevue Farm. 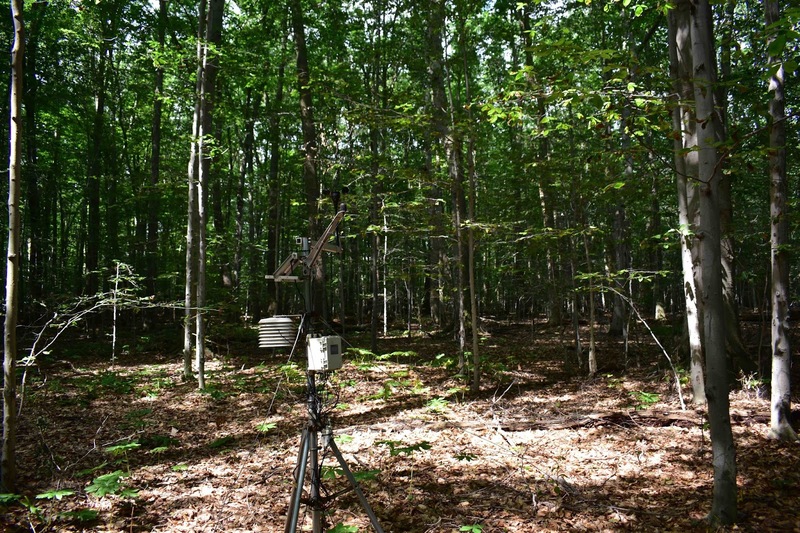 The location of the photo is near the North Woodlot Weather Station (N 41 29.969, W 81 25.234) facing north into the highest density of Beech saplings. Photo courtesy of Anthony Koonce. Figure 3. View of the secondary canopy clearing in the North Woodlot of Squire Valleevue Farm. The location of the photo is near the North Woodlot weather station (N 41 29.969, W 81 25.234) facing west into areas dominated by maple and oak. 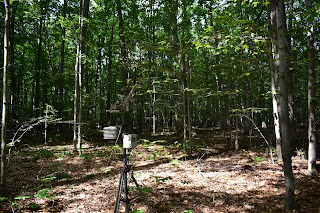 The photo includes the North Woodlot Weather Station located at N 41 29.969, W 81 25.234. Photo courtesy of Anthony Koonce. The University Farm Environmental Monitoring Program at the Case Western Reserve University Biology Field Station has two weather stations in the Farm’s research area (): one is in an open field (N41 29.813, W81 26.167) and the second is in the North Woodlot (see Figure 3). At both locations, silicon pyranometer sensors monitor solar radiation in addition to a range of other environmental variables. All data for the Environmental Monitoring Program are archived here. Figure 4 shows the pattern of variation of the ratio of forest to open field solar radiation. Figure 5, replots the Figure 4 data for the 2015 to 2017 interval. Figure 4. 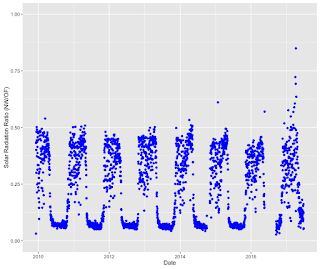 Daily-averaged solar radiation ratio of forest to open field for the period of December 2009 to July 2017 in the research area of Squire Valleevue Farm. Data gaps in 2016 and at other times are the result of data logger maintenance and replacement issues. Figure 5. 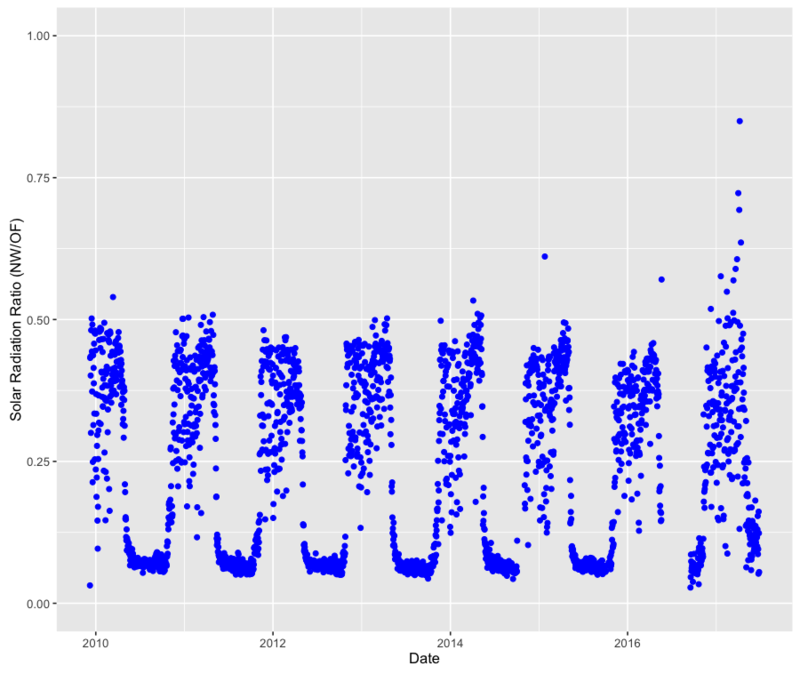 Daily-averaged solar radiation ratio of forest to open field for the period of December 2015 to July 2017 in the research area of Squire Valleevue Farm. Data gaps in 2016 and at other times are the result of data logger maintenance and replacement issues. Prior to 2016, Figure 4 shows that the ratio of forest to open field solar radiation drops during leaf out in the Spring to a value of about 0.06. 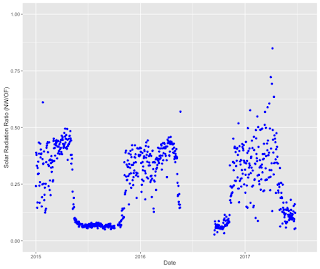 Data logger maintenance and replacement schedules limited observations during the Spring of 2016, but the end of the summer had a similar ratio to previous years. 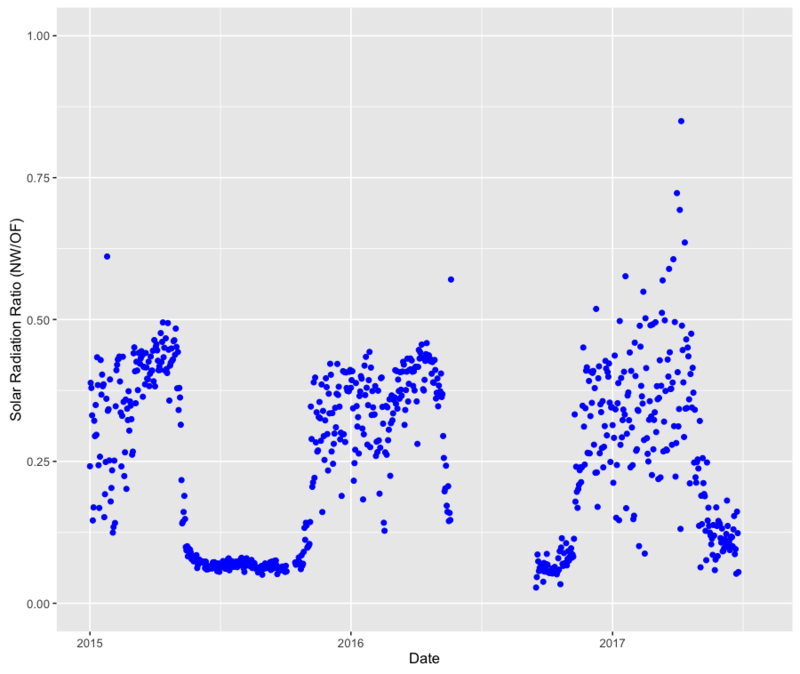 With the spread of BLD into the North Woodlot, however, the leaf out period in Spring 2017 is quite different that in earlier years and appears to be stabilizing at an average of 0.12, nearly twice the level of earlier years. It is not yet clear whether this increase in solar radiation in the Beech dominated forest is caused by thinning of leaf cover in the secondary or primary canopy. Preliminary observations with a drone, however, indicate that the primary canopy also has increased gaps. Fortunately, we have extensive quarter point surveys of the North Woodlot along with a set of fish-eye images of the forest canopy taken about ten years ago. Analysis of these data will be the subject of future posts. Ohio Division of Forestry. 2016. Forest Health Pest Alert. Beech Leaf Disease. http:// http://forestry.ohiodnr.gov/portals/forestry/pdfs/BLDAlert.pdf. Last date viewed: July 26, 2017.